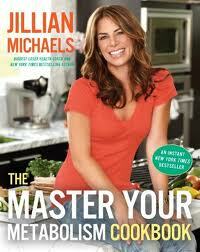 Summary: Jillian Michaels compiled more than seventeen years of research into the Master Your Metabolism plan in order to expose how the secrets of hormonal balance through proper nutrition accelerate weight loss, boost immunity, and reverse aging. Now she makes the process of revving up your metabolism to get hot, healthy, and happy even simpler with The Master Your Metabolism Cookbook. I really like the information at the beginning of the book, before the recipes although it’s a bit scientific and I need to re read it at least one more time for it to sink in. I like the idea of tasty, healthy meals that have multiple health benefits such as Anti-Cancer, Heart Healthy, Boosts Immunity, Improves Digestion, Improves Mood etc…. In fact that information is given at the top of each recipe. The Basics section includes poached chicken, hard-boiled eggs, black beans, brown rice, couscous, quinoa, fruit vinaigrette, vegetable broth, simple marinara sauce and ketchup. I wasn’t able to get permission to share a recipe with you but you can preview a LARGE portion of the book at Google Books. May I suggest when you get the book, you try Grilled Skirt Steak with Chimichurri Sauce from page 140. The only reasons the book is not a five star book is because the recipes have a lot of ingredients my picky family doesn’t like. Luckily I’m pretty good at altering recipes, I almost never do a recipe exactly as it is written. So I have to alter most of the recipes. If your family isn’t as picky as mine or you are single and cook what you want, this would be better for you. Also the recipes don’t have photos with them and I’ve mentioned before how important I think that is. Besides the beginning section, there is lots of information throughout the book in little side notes. Also each recipe has it’s health benefits, an explanation, ingredient list, detailed instructions and nutrition information.